Monsanto Hall at the Missouri Botanical Garden echoed with the song of the humpback whale Sunday night as nearly 150 attendees of the World Ecology Gala imitated the majestic animal. The favorite sea creature of National Geographic Explorer-in-Residence Sylvia Earle, the humpback’s song can travel for 100 miles. She wished the whales could hear them. 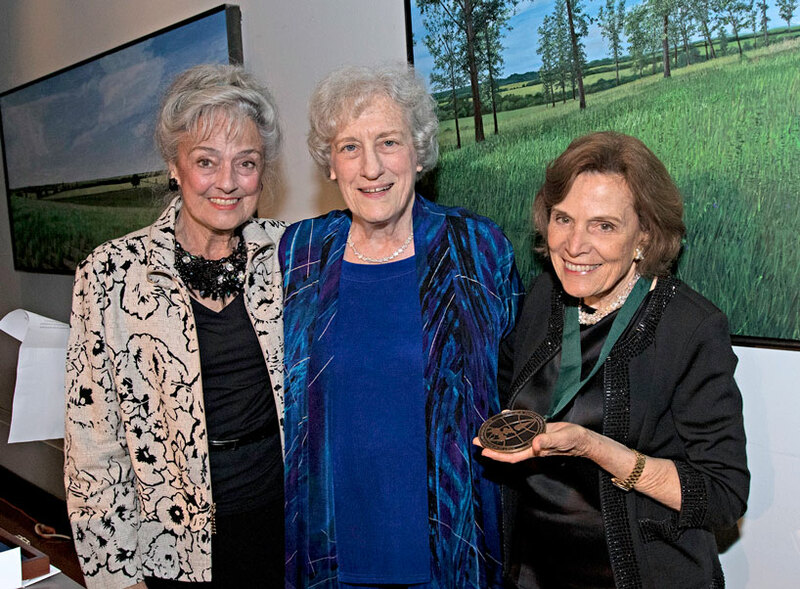 The night was in honor of Earle, the 21st recipient of the World Ecology Award from the Whitney R. Harris World Ecology Center at the University of Missouri–St. Louis. The award is presented annually to individuals who have made significant contributions to the protection of the global environment and to a better understanding of the balance between human habitation and Earth’s biodiversity. 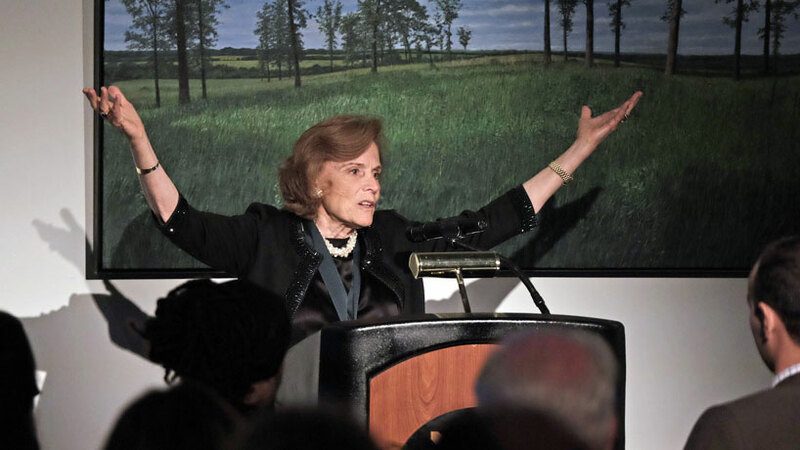 An animated Sylvia Earle engages her audience Sunday in questions on next steps in saving the oceans that people have so carelessly destroyed in her lifetime. Earle has made it her mission to save marine ecosystems, from coral reefs to kelp to bluefin tuna and even sharks. Called “Her Deepness” by The New York Times and “Hero for the Planet” by TIME magazine, the 81-year-old Earle continues to dive for segments shown on the National Geographic channel. She is the founder of Deep Ocean Exploration and Research, Inc., founder of Mission Blue and SEAlliance, and chair of the Advisory Councils of the Harte Research Institute and the Ocean in Google Earth. Earle believes that every living thing in the water has innate value, plays a role in the balance of all life and deserves to be protected. Despite the crushing fact that it only took a couple hundred years for humans to destroy ecosystems that formed over centuries, Earle remains hopeful. “We’ve learned more and lost more,” she said. “But children today are so lucky. They’ve come at just the right moment. They are the beneficiaries of all our knowledge” – a thought that highlighted another important part of the night: supporting the education of future conservationists. About 80 percent of proceeds from the gala fund graduate biology students at UMSL. Funding future conservationists is the main goal of the Harris Center, which partners with UMSL, the Missouri Botanical Garden and Saint Louis Zoo to support education and research ecology and biodiversity conservation. Housed at UMSL, the center underwrites activities of this unique partnership trio in myriad ways, including scholarships and public awareness projects. The Harris Center has helped 275 UMSL students graduate with master’s or doctoral degrees in ecology, evolution, systematics and conservation. Those alumni currently serve in conservation roles in 13 states and 17 countries. For this, Earle thanked the Harris Center and its supporters. She even called St. Louis with its Missouri and Mississippi rivers, a “hope spot.” The phrase means, to her and her followers, an area where it’s still possible to save and protect wildlife. Earle also pointed to the ever-growing evidence of nature’s resilience. So when people give nature a break, it does in fact begin to repair itself.